Whether it's drawing, painting, or crafting, he'll spend hours working on projects and creating crafts. This is great for me because I love to see my kids being creative and using their imaginations. We've got shelves full of notebooks my little guy has used to draft his crafting plans and to just write, but this week, we decided to try something a little bit different. We had the chance to try out a SmitCo LLC journal designed for kids to use to record their thoughts, hopes, dreams, and ideas. While it's marketed toward girls, my son found this journal to be a fantastic addition to his notebook collection. If you've got boys or girls who love the Diary of a Wimpy Kid books, for example, you may find that this type of journal is perfect for your little ones. Come up with creative ways to spend their time? A journal like this could be a fantastic Christmas gift or just a way to encourage your child to record their thoughts and practice writing. The reason I love notebooks so much is that they're completely versatile and you can use them for literally anything. When it comes to my son, he has several notebooks he uses for different things: drawings, ideas, projects. 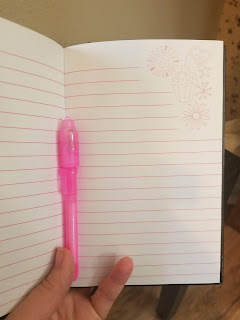 A journal is a fantastic way to encourage critical and creative thinking in both boys and girls and is a fairly inexpensive gift for the budget-conscious shopper. What do you think? Have you ever used a journal like this? Leave me a comment and let me know!